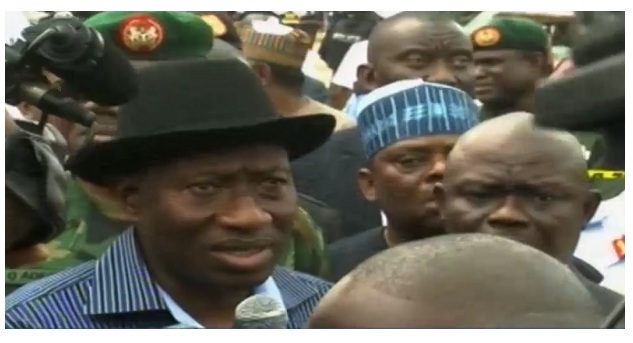 The explosion that rocked the Nyanya Park in Abuja, Nigeria’s Federal Capital Territory, has forced the Nigerian President, Goodluck Jonathan to cancel a trip to the South West city of Ibadan. President Jonathan was at the scene of the blast with the Senate President, David Mark and Chairman of PDP, Adamu Muazu. “We have lost quite a number. We condole with our country men and women. The issue of Boko Haram is quite an ugly history within this period of our own development. Government is doing everything to make sure that we move our country forward. But these are the unnecessary distractions that are pushing us backward. But we will get over it”, he said. At least 71 people have been killed, and 124 injured in the blast that rocked the highly populated motor park in Nyanya, about 16km drive from the Abuja city centre. The incident is said to have occurred at about 6.45 am during the rush hour. NSCDC officials, Fire Service, NEMA, the DSS and Police have been on ground battling to contain the situation. The dead victims as well as the injured have been taken to various hospitals by ambulances and vans belonging to the National Emergency Management Agency, NEMA, the Federal Road Safety Commission, FRSC, the Police and the Vehicle Inspection Office, VIO.